I also write for several music publications and am a regular contributor to DownBeat jazz magazine. Now Offering On-line Video Lessons Via Skype and iChat! Private Lessons are now available over the internet in crisp HD quality. I am honored to be one of Pete's certified instructors! Check back for upcoming jam class dates! 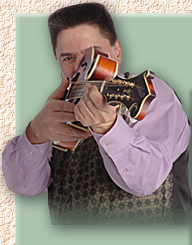 For more information about the Wernick Bluegrass Music Method, click here. Endorsing Artist for Nechville Banjos! In June of 2008, Keith signed an artist endorsement contract with Nechville Banjos at the summer NAMM show in Nashville, TN. The Nechville design is revolutionary and offers numerous advantages over the standard banjo. Plus they play and sound truly amazing.